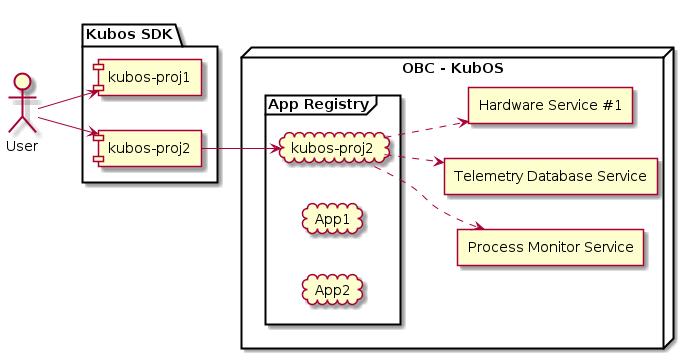 Kubos users develop custom flight software for their OBCs using the Kubos SDK. This custom software is then used to communicate with the various core and hardware services in order to interact with the system and execute mission logic. This series of tutorials will walk a new user through the major steps required to program a mission and then communicate with a system once it is in-flight. After the completion of these tutorials, the user will have created a mission application capable of querying their hardware for telemetry data and then storing that data into the telemetry database. These tutorials cover all of the ways a user might directly interact with a system from the ground. There is no coding required for these actions, however some scripting may used for example purposes. Important system tutorials which should be approached after mastering basic system interaction.